We’re celebrating the lead-up to the National Design Awards gala with a week-long tribute to Jack Lenor Larsen, winner of this year’s Director’s Award. Using objects from the museum’s collection, we will highlight some of Larsen’s many roles in the design community: master weaver, textile designer, entrepreneur, collector, scholar, author, and advocate for the world’s craft traditions. Larsen opened his eponymous design firm in 1952 in New York City, and quickly gained a reputation for his avant-garde designs, which often used unexpected materials in exciting ways. Trained at Cranbrook, Larsen’s work focused on integrating the aesthetics of hand-weaving with technical innovations. Limelight, from 1953, demonstrates his interest in playful color and textural combinations. The warp is comprised of cotton, jute, viscose and Metlon, a reflective metallic plastic laminate. The fabrics is hand woven, with warp floats that create an irregular three-dimensional vertical stripe pattern. Dots of lime green and royal blue viscose are enlivened with the bright glittering of metallic blue yarns. As its name suggests, the fabric suggests the limelight of a theater stage, emanating a radiant, incandescent glow. Jacqueline Sullivan is a graduate student in the History of Decorative Arts and Design program at the Cooper Hewitt. She is currently a Master’s Fellow in the Textiles Department. 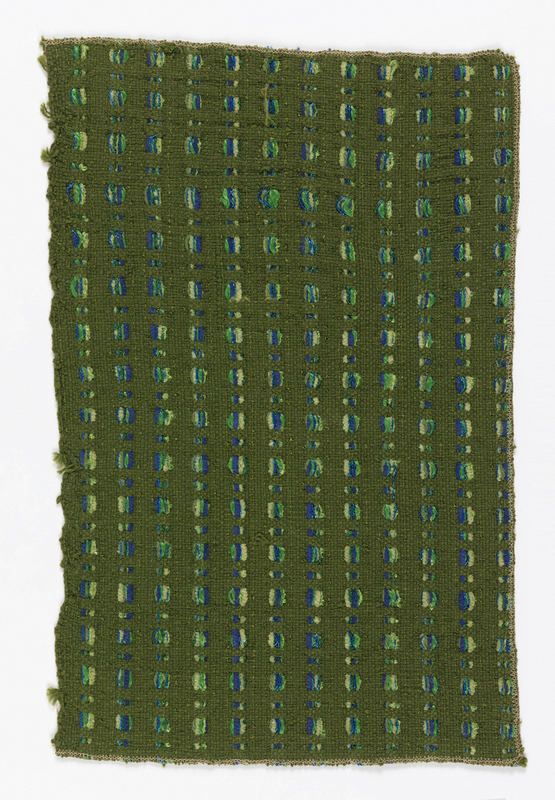 Sample, Limelight, 1959. cotton, rayon, jute, metallic. 1959-99-5.